You are a C-suite officer or senior executive and your company is "in play" and may be acquired. How do you protect yourself or even advance your position in the event of a "successful" acquisition and change in control of your company? My article on this subject was published March 1, 2016 by CEOWorld magazine. The article first discusses this situation faced by CEOs. COOs, CTOs, CMOs and other C-Suite and senior executives, then advocates self-assessment of your role and importance in the pre-deal and post deal environment, and finally the importance of establishing your role and rights in a retention / change of control agreement. Proper structuring to avoid potential excise tax for parachute payments under IRC §280G. If you or one of your colleagues is in a change of control situation, I am glad to assist. Please do reach out to me at radelson@engelschultz.com. Robert A. Adelson, Esq. 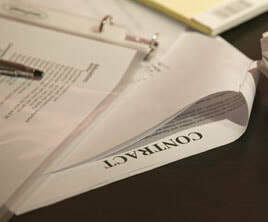 is a corporate and tax attorney and partner at Engel & Schultz LLP, Boston, Massachusetts. He represents C-Level executives and key employees in negotiations over executive employment terms, equity, compensation, relocation, retention and separation agreements, severance packages, and where necessary suits over wrongful termination. 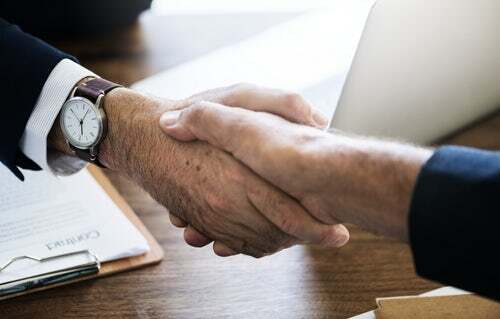 ​Last Tuesday, on October 30, 2018, CEOWorld magazine published an article I wrote on “Negotiating the Right Executive Compensation Package for Yourself” The magazine advised me that I can use “Featured in the CEOWOLRD magazine” and the CEOWORLD “Logo” on my website. This article was designed for CEOs and other C-Suite, VPs or other senior executives who when negotiating a new executive job offer or employment contract need to give attention to the executive compensation package that it contains all the key features to fully compensate the CEO or senior executive for the critical services he or she provides to the company and its owners. Create the right executive bonus plan and other incentives that align with the company for growth. The article also discusses how the CEO or senior executive can use these goals and means of achieving them to strengthen his or her position at the company. These negotiations can serve to demonstrate to your new employer your abilities as a skilled executive capable of managing complex situations that affect himself or herself directly. With more than 12.4+ million page views, CEOWORLD magazine is the world’s leading business magazine written strictly for CEOs, CFOs, CIOs, senior management executives, business leaders, and high net worth individuals worldwide. It is my hope that this article will be helpful to CEOs and other senior executives who are negotiating the important executive compensation package and equity terms of a new job offer or renegotiation of executive contract terms with your current job or under an executive retention agreement if your company is in play. If you or any colleague of yours has a need in this area, please do reach out to me at radelson@engelschultz.com. Last Tuesday, on September 25, 2018, CEOWorld magazine published an article I wrote on “An Executive Severance Agreement Protects Your Employment, Career and Reputation” The magazine advised me that I can use “Featured in the CEOWOLRD magazine” and the CEOWORLD “Logo” on my website. This article was designed for CEOs and other C-Suite, VPs or other senior executives who, when negotiating a new executive job offer or employment contract, need to give attention to severance terms even where the employment is stated to be “at will.” Also, even if severance is not included at the outset, it can be negotiated later, even at the time of employment termination. Protections for the executive’s reputation. The article also addresses items the employer may seek including non-competes, releases and waivers and negotiation strategies for executives on such items. ​It is my hope that this article will be helpful to CEOs and other senior executives who are seeking to negotiate severance terms into their job offers, employment contracts or separation agreements, or need help on particular terms of the severance package. 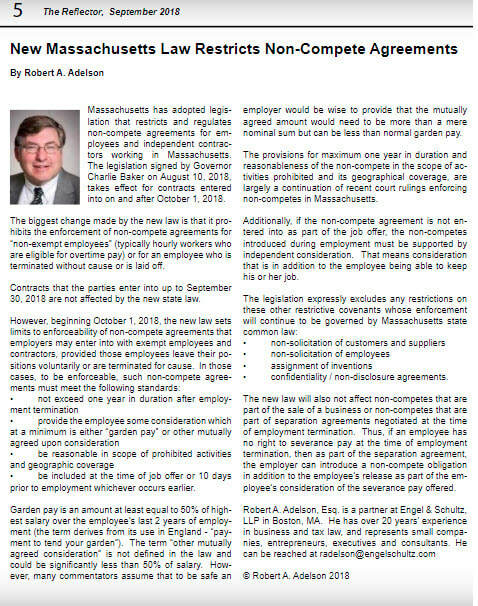 If you or any colleague of yours has a need in this area, please do reach out to me at radelson@engelschultz.com or call 617-875-8665. This is an article of mine published last week in the September 2018 issue of the IEEE Reflector, the online monthly newspaper, that circulates to the 10,000 members of IEEE in Massachusetts. www.ieee.org My article is featured on page 5 of the current September 2018 issue. Be included at the time of job offer or 10 days prior to employment whichever occurs earlier. To read my full Reflector article, go to this LINK: https://issuu.com/ieeeboston/docs/septemberdr2018?e=18904825/64145987 and view it on page 5. ​If you have any questions on this article, or questions in dealing with a non-compete agreement for yourself or a colleague, please email me at radelson@engelschultz.com. The article indicates how a severance agreement protects executives employed on an at-will or other basis in the event of termination without good cause, and that it is wise to provide for severance terms in an employment agreement or offer sheet at the outset of employment. However, a severance agreement can be made at any time throughout the employment of the executive. Finally, the article also address items the employer may seek including non-competes, releases and waivers and negotiation strategies for executives on such items. Are you are an employee or executive reviewing a job offer or employment agreement with or without severance terms and need advice on terms or its enforceability? Have you been terminated or face termination and have similar concerns? Have you received a severance agreement and need advice on its terms or what to seek in negotiations? ​In any of those cases, if you have questions or need assistance, please email me at radelson@engelschultz.com or call 617-875-8665. About Executive Employment Attorney Robert Adelson, Esq.